In any production environment, there are situations that require an administrator to stop production services for a while to perform certain operations on production nodes. This may be the planned nodes servicing, their planned stops, or planned power outage, etc. After turning on the nodes and resuming their production operation, it is nice to have fully-synchronized data on all nodes in order to avoid long-lasting synchronization process that can take a considerable amount of time in most production environments. Enabling Maintenance mode in StarWind Management Console before planned shutdowns saves time required for data synchronization between nodes after exiting Maintenance mode and simplifies the process of making any changes in highly- available production environments. To simplify the production startup after the scheduled service interruption, just turn on the Maintenance mode before performing various actions (shutdown, reboot, etc.) on the nodes. Even if nodes are turned off incorrectly after entering the Maintenance mode, all data will be safe. After finishing the operations on the nodes, just exit the Maintenance mode. As soon as this has been done, production can be launched without any need to wait for either fast or full synchronization. The only thing that should be checked is connectivity between the devices under maintenance. When a device enters the Maintenance mode, it should contain fully-synchronized data on all HA nodes. Maintenance mode for the selected device will be enabled/disabled on all nodes simultaneously. When an HA device is in Maintenance mode, connection to this HA device is blocked on any node containing it to ensure integrity of data till the Maintenance mode is off. As a result, the synchronization before starting the HA operation is avoided, as data on all nodes is completely identical to what had been there before entering the Maintenance mode. NOTE: Only the selected HA device will enter into Maintenance mode. In case a reboot or shut down of the nodes is required, Maintenance mode must be enabled on all HA devices the node has. Make sure that the production VMs that use the storage were shut down before devices enter the Maintenance mode. Maintenance mode also should be enabled in a hypervisor environment. The StarWind Maintenance mode for the selected device will be enabled/disabled on all nodes simultaneously. 1. 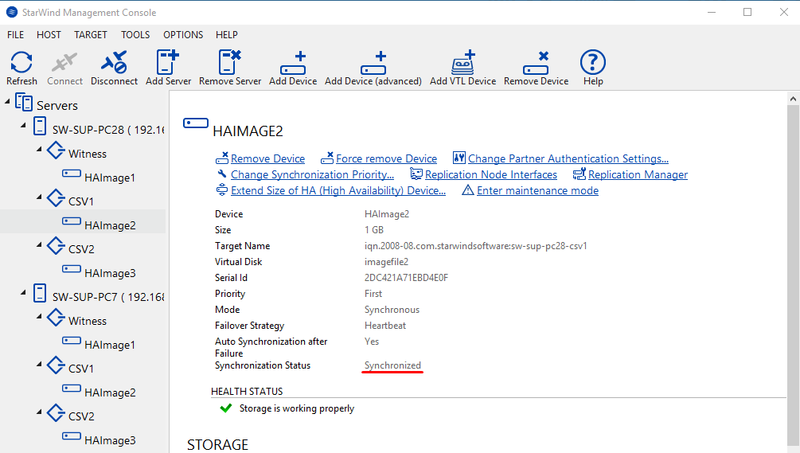 Before entering the StarWind device into the Maintenance mode, it must be in the Synchronized state on all nodes. 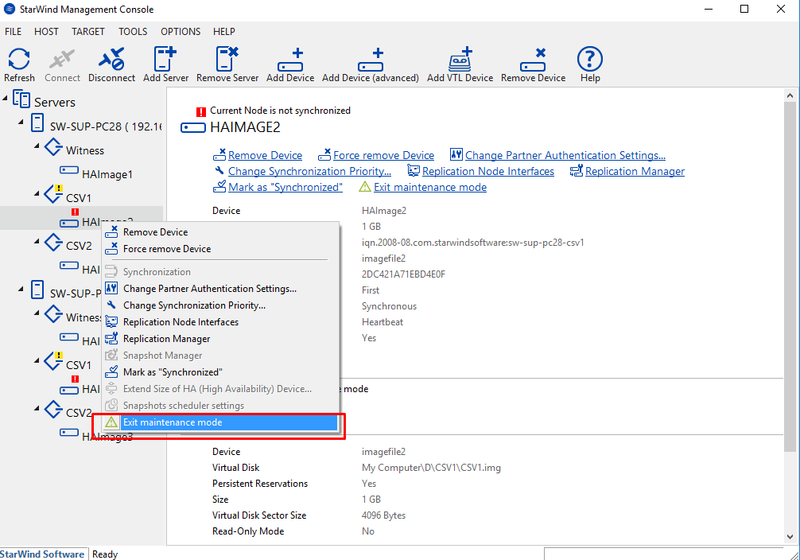 For this purpose, open StarWind Management Console, connect to the servers and check the device state by clicking on it. 2. 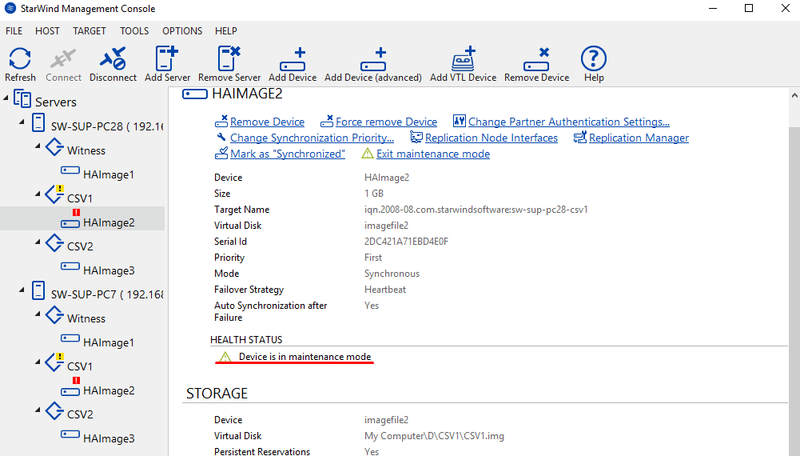 Select “Enter Maintenance mode” by clicking the StarWind device. 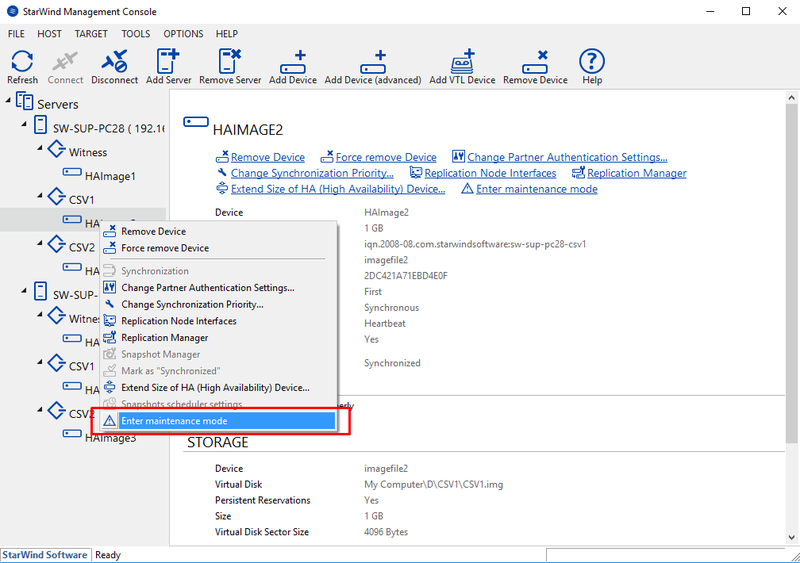 The device will be set into Maintenance mode on all StarWind nodes. 3. After all planned servicing actions are done, select “Exit Maintenance mode” by clicking the StarWind device. Exiting the Maintenance mode allows the nodes to start working in the normal operation mode without either full or fast synchronization.